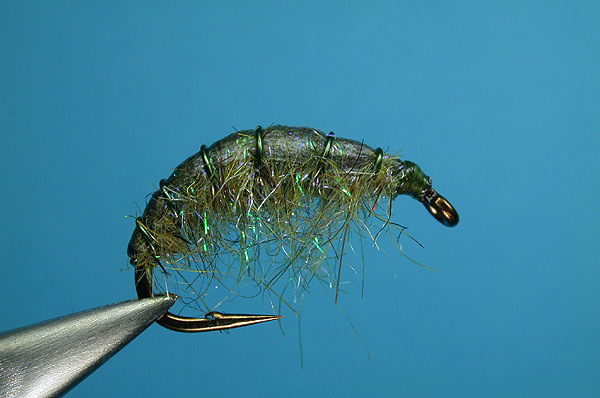 The freshwater shrimp is one of the most popular natural food sources for trout. A freshwater shrimp is usually referred to as a scud. Don’t worry if you didn’t know that already because I didn’t until I started writing this. They are also called by a few other names which we’ll get to in a second. Scuds are in the class crustacea, order amphipoda, family gammaridae. They are also commonly called gammarus shrimp and sideswimmers. Scuds are an entirely aquatic species, so they never venture on land. There are males and females and both are needed for reproduction. Either way, they taste really good with a nice white wine. The freshwater shrimp (notice I am using its various names interchangeably) will reproduce several times a year. The male will carry the female on his back during mating. The female then carries around fifty fertilized eggs in her egg pouch. The eggs are an orange color and can be clearly seen beneath her transparent shell. Young scuds hatch within the pouch. They then emerge live and fully formed, yet almost microscopic in size. 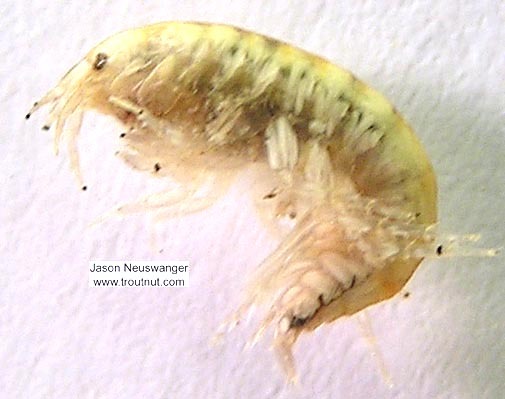 The young freshwater shrimp will form a hard shell (exoskeleton) quickly. This is shed frequently as the scud grows larger. At times, the shed skins can be seen on the water's surface. Scuds will range in size to about ¾ of an inch in length although most adults reach about ½ inch at maturity. The scud has no natural defense other than simple cover or camouflage. For this reason, they will take cover in weeds and will be more active during early morning or evening hours. They are most active at night as they are harder to be seen then. Otherwise they could end up as dinner for a lucky trout or bass. The scud is basically a scavenger type feeder eating mainly organic plant materials and algae. The exoskeleton is transparent so the scud's diet determines their actual color. This helps their camouflage defenses because they tend to take on the color of their surroundings. Gives new meaning to the old adage "you are what you eat" doesn't it? Oddly enough, scuds are not solely algae eaters and will occasionally feed off of injured aquatic organisms. Scuds are found in all depths of water but generally in bodies of water that are less than 35 feet deep. They also require calcium to build their shell, so lakes in low lying areas are conducive to the scud's purpose. Among the lakes of the interior United States, scuds are the single most source of food for trout. Scuds make up one-third to one-half of the trout's complete diet. No other food source comes close to matching that percentage. Who says that fish aren't finicky eaters? Because the scud doesn't "hatch" in the general sense of the word, scuds can be fished year round. There are peaks to the feeding of the fish population, but the scud is always the largest component of the trout's feeding content by far. The most effective way to fish the scud is to bring it on the bottom or very near to it. Fishing off the middle is effective with an unweighted scud imitation. Simply retrieve a bit and let the scud drop down, then retrieve again. 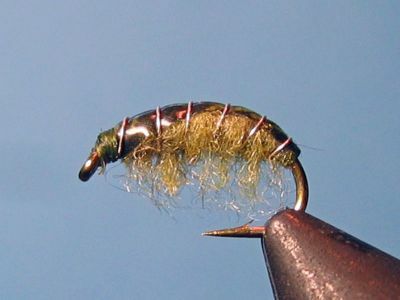 This imitation of the scud's swimming drives trout crazy and success is just a rod twitch away!